Art– Stuart Immonen as usual on this book is delivering top notch groovy-ness in every panel. I’m loving it! Story– Baron Zemo is on the verge of killing All New Captain America who manages to turn the tides before Nomad shows up to save him. Samuel takes down Lucas and his flea infested ship with the aid of his powers. Misty takes down taskmaster. There is a backup plan however with Baron Blood. Batroc shows up for revenge. Nomad deals with Batroc while Samuel tracks down Blood. The Vampire escapes after killing Samuel’s long time pet, Red Wing. Cover- This series has awesome covers and this month may just be my favorite yet. It shows our All New Captain America half submerged in a river, in a jungle. Both are bathed in an ethereal purple mist which sets quite the tone. Characterization– Samuel Wilson is the boss. Watching him facing off with Baron Zemo and turning the tides was executed perfectly. Just like before he’s out of his weight class but Rick Remender manages to use his powers inventively enough to even the odds. I enjoyed your review. but I do not like the way this New Captain America is portrayed. 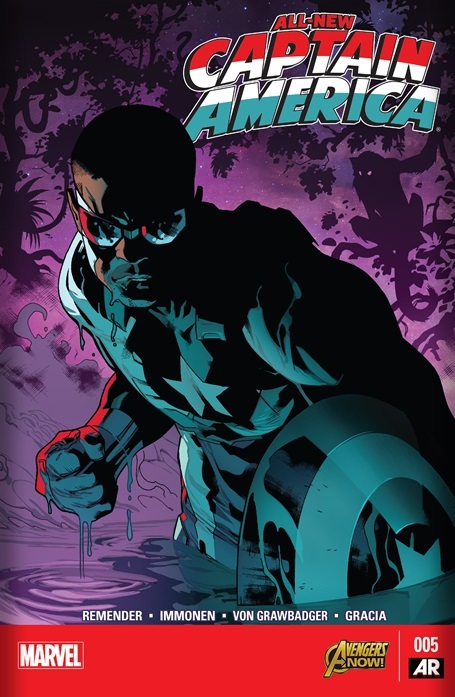 I’m happy to have a Captain America of color, but each issue seems to have Sam Wilson struggling to fill the real Captain America’s shoes, making so many mistakes and barely winning battles. When are we going to get a baddass hero of color, who is actually on the level of Steve Roger/ Cap, Wolverine, etc. Maybe I;m being to critical, but this all new Captain seems like a gimmick until Secret Wars starts and brings back the original Cap. Im not really getting into Sam Wilson as capt America. Firstly because in strength, speed, reflexes, and endurance, he is a step down from Steve Rogers. Maybe if he had been injected with a newer version of the super soldier serum like tony starks extremis, my interest would be more peaked. But as is, hes just an average athletic guy in a suit which means he is seriously outclassed with most of the baddies Steve Rogers has slugged it out with. And second, and more importantly, this is only a temperary gap. Im sure after the secret war marvel reboot, the original cap will be back.